Book clubs (or literature circles) are a great way to meet your higher reader's needs while you do guided reading. 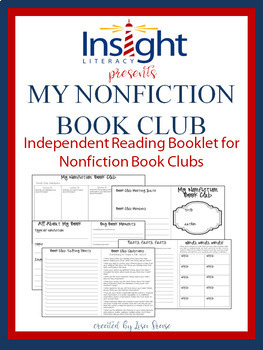 This booklet focuses on reading nonfiction books. Students select a topic together, but each student reads a different book on the topic before meeting with their book club, then come together to share their thinking and knowledge about the topic. In this packet, you will receive a printable booklet that you can fold and staple for your students. 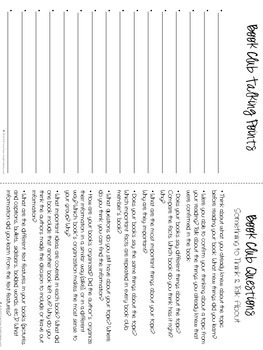 This booklet requires students to record their thinking and prepare for their book club meeting. A rubric is included so that you can get a grade! The booklet includes 6 student pages (half sheets), plus one group chart for students to share their thinking. The original purchaser may use this teaching resource in their classroom or homeschool (personal home or your homeschool coop class that you teach). 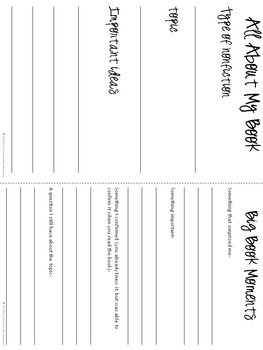 You have permission to make copies for student use for your classroom or homeschool only. Do NOT share, reproduce, or distribute print or digital copies in any form. 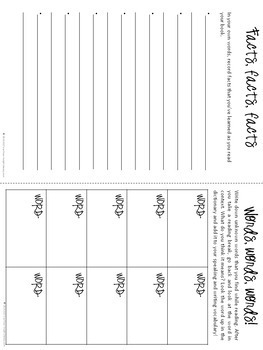 Please refer interested teachers to my TPT store at www.lisafrase.com to purchase their own copies of this teaching resource. Additional licenses for other teachers use can be purchased at a discount. Do NOT upload this teaching resource to personal, school, district, or third-party websites. Do NOT modify this resource and make available for free or for sale online or offline, in print or digitally. Distributing print or digital copies without express written permission of the author is a violation of U.S. copyright laws, and the Digital Millennium Copyright Act (DCMA).